Agriculture still employs a large proportion of the people in Lao PDR. Small farms with low technology grow food mainly for local consumption. But nematodes cause many problems in many different crops and areas—one does not need to travel far in Laos to see the effects of plant-parasitic nematode attacks on plants. 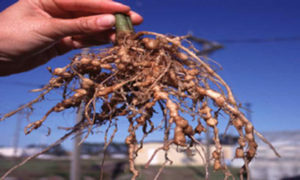 In most markets, the roots of plants are visibly affected by Root-Knot Nematodes, and in many fields are patches of poorly producing plants. Yet few people in the country even know they exist. Phetsamone Songvilay, from the Lao Plant Protection Center, and Dr Mike Hodda, from Australia’s CSIRO, are trying to change all that. Phetsamone has been working with Mike to survey the fields and markets of Laos, and now the Crawford Fund has helped Phetsamone and her technical staff to visit Thailand and Australia to learn about communicating the results of their work. “I am the main person who has studied nematodes in the whole country, so I need to identify many different species. I also need to know about the many different ways to manage nematode problems. I need to talk and write about nematodes for farmers and students. By doing these things, I can make a big difference reducing crop loss to nematodes in Lao and helping the farmers,” said Phetsamone. Here Phetsamone and her laboratory technician, Nilandone Phannamvong, learnt about culturing techniques and the production of biocontrol agents on small scales by farmers. Developing materials for teaching awareness of nematode damage and base-level training for quarantine officers. 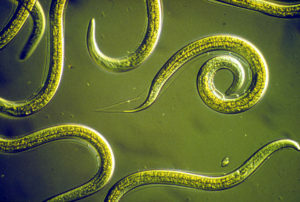 Learning techniques for the biocontrol of nematodes. Phetsamone has also learned about beneficial nematodes to use in biocontrol of grasshoppers and other insect pests. Observing teaching techniques, learning advanced nematode techniques, nematode management options in different situations, and biocontrol work. “I learned a lot. It will help me so much when I return to Lao. It will help with projects in IPM Unit. Thank you to the Crawford Fund for the funding,” said Phetsamone. Fresh from the experience, she returned to Lao to present the first ever course on nematodes to students at the National University of Lao in February 2016. Reducing the chronic and sometimes severe crop losses to plant-parasitic nematodes is a big task, but Phetsamone, Mike and The Crawford Fund are doing something about it through research and communicating that research.